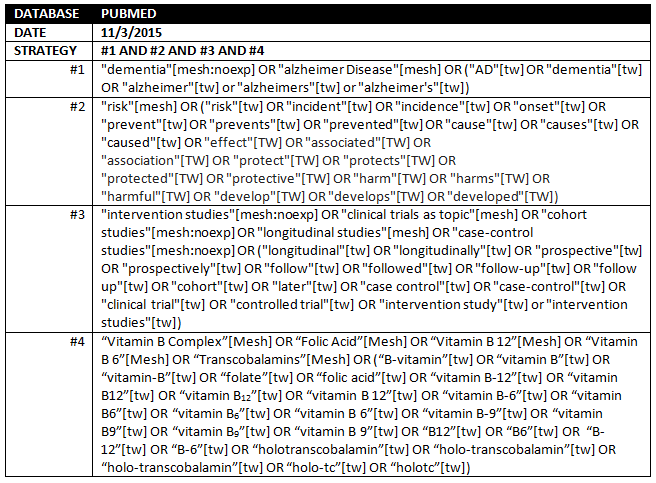 We searched Pubmed for peer-reviewed articles reporting on the association between B-vitamins and Alzheimer’s disease (AD) incidence in cohort or nested case-control studies. 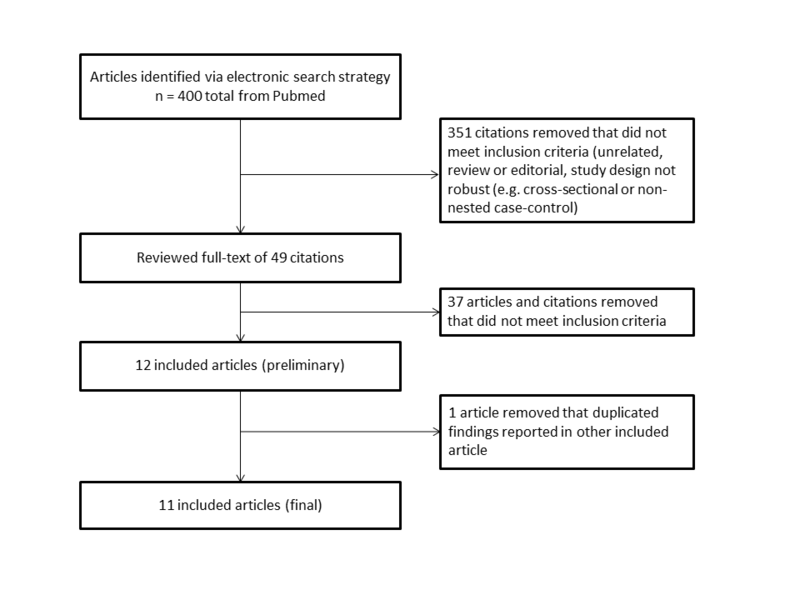 The search returned 383 unique citations that, after title and abstract review against our inclusion criteria, were narrowed down to 49 citations for full-text review (all published in English). Of these, 12 fully met criteria for inclusion in our summary tables. We additionally excluded 1 article that otherwise met our inclusion criteria, but duplicated an analysis from a cohort that contributed data to another included article. We reviewed the duplicate article and selected the most informative article based on sample size, follow-up time, exposure assessment or modeling, and appropriateness of analytic methods. Please see our methods section for more detail on our general systematic review methods. Some cohort studies produced multiple articles reporting on the association between B vitamins and risk for Alzheimer’s disease. To avoid presenting duplicate results, we reviewed such articles on a case-by-case basis and selected the most informative article(s) based on sample size, follow-up time, exposure assessment or modeling, and appropriateness of analytic methods. We included main results from Luchsinger 2007 (Arch Neurol) and excluded results from Luchsinger 2008 (J Nutr Health Aging) which presented a subset of results in the same population from Luchsinger 2007. Luchsinger JA, Tang MX, Miller J, Green R, Mayeux R.
Relation of higher folate intake to lower risk of Alzheimer disease in the elderly. Arch Neurol. 2007 Jan;64(1):86-92. Luchsinger JA, Tang MX, Miller J, Green R, Mayeux R. Higher folate intake is related to lower risk of Alzheimer's disease in the elderly. J Nutr Health Aging. 2008 Nov;12(9):648-50.